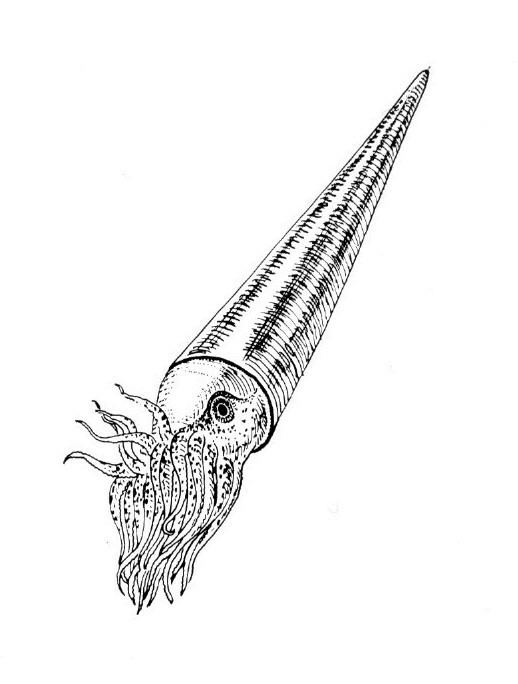 Cephalopods, related to modern squids and cuttlefish, swarmed in the ancient seas. At times they were the dominant invertebrates and some reached several feet in length. In shape they ranged from straight-shelled species to ones elaborately curled and ornamented. Only the wide end of the shell was occupied by the soft-bodied animal that built it. The rest was closed off and divided into a series of chambers by cross walls. When the fossil is broken open these walls are often mistaken for the vertebrae of a fossil fish.